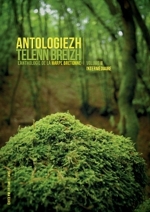 ANTOLOGIEZH TELENN BREIZH (The Breton Harp Anthology) is a unique collection of three music books dedicated to the Celtic harp featuring around forty harpists from Brittany or living in Brittany who are among the best musicians performing the modern Celtic harp. Aman, Pell diouzh an trouz (QUEFFÉLÉANTH) 1-71. An Tad moualc'h (BARBEDETTE) 1-23. Ar Plac'hdimezet gant an diaoul (TRONSON) 1-76. Ar Soudarded zo gwisket e ruz (LEGOVIC) 11-52. Ar Vuoc'hig-doue vihan (ISAMBERT) 1-40. Arabatdevin halegenn ar sorserien ! (MYRDHIN) 1-59. Ballade en automne (BARONNET) 11-22. Barzh ti Maria Kerran (ROPARZH) 11-75. Complainte de la blanche biche (GOURLAOUËN) 1-36. Courage beau marinier (MÉRIENNE) 1-56. Dans les prisons de Nantes (AUFFRET) 1-21. Dansons la guedaine (NICOLAS) 1-61. Dans a ruz (KERMABON) 11-49. Dans er c'hoat (BERTRAND) 11-25. Dérobée de Guingamp (La) (BOUCHAUD) 111-31. EKoun Minettig (Marche triste) (NOBLET) 1-64. EKoun Minettig (Sous le camélia) (NOBLET) 11-67. EKoun Minettig (Souvenirs heureux) (NOBLET) 11-66. En dro Inis Arzh (STIVELL) 111-75. En Teir seienn (VESTUR) 1-81. Enez ar C'havr (MYRDHIN) 111-60. Fille changée en cane (La) (WAMBERGUE) 1-83. Gavotennoù ar menez (ARZEL) III-16. Gavotennoù ar menez (VESTUR) 111-82. Gwerz Kêr Is (CADORET) 11-36. Gwerz Marv Pontkallek (NOGUÈS) 1-65. Heuliad dans fisel (BARBEDETTE) 111-19. Heuliad dans plin (BRÉGER) 111-33. Heuliad gavotennoù bigoudenn (NICOLAS) 111-61. Heuliad laridennoù Pondi (PHILIPPE) 111-68. Kan ar bugel (JAMAIN) 11-44. Kan eured Banaleg (PHILIPPE) 1-66. Kas a-barh des papillons (CAPPOEN) 11-38. Kezeg ar mor (KERLEO) 111-44. Koat an noz (BERTRAND) 111-25. Komz e hrer dein a zimein (MÉRIENNE) 11-58. Mais qui sont ces lutins, sur la lande? (FRANÇOIS) 1-35. Marche du 32 décembre (BARBEDETTE) 11-20. Mari aimable (Le) (TROUILLAUD) 1-79. Merhed er Bregéreu (LEVISAGE) 1-53. Pa oan-me bihan (VESTUR) 11-83. Passepieds du Pays de Saint-Brieuc (WAMBERGUE) 11-85. Passons la lande (MÉRIENNE) 111-58. Pedenn evit Breizh (COCHEVELOU) 1-34. Peh trouz zo war an douar (MILLET) 1-57. Pilé menu du robinet qui goutte (LHOPITEAU) 111-56. Quand j'etais chez mon père nous étions cinq enfants (LE SIGNOR) 11-54. Ridées six temps (BRÉGER) 1-30. Rond de Saint-Vincent-sur-Oust (TROUILLAUD) 1-80. Scottish à Jean Durand (BARONNET) 1-24. Son ar razh-koed (WAMBERGUE) 111-85. Suite de maraîchines (TRONSON) 11-78. Suite de marches (BRÉGER) 11-34. Suite de ridées (CADORET) 111-35. Suite de ridées (LEVISAGE) 111-54. Suite de ronds paludiers (LEGOVIC) 1-49. Ton a Vro Arzhal (JAMAIN) 111-42. Ton baie an degemer (BARBEDETTE) 11-21. Tristan et Yseult (QUEFFÉLÉANTH.) 1-70. Trois matelots du port de Brest (AUFFRET) 11-19. Valeur d'une épille (La) (TROUILLAUD) 111-80. Variations sur un Noël du Pays de Guérande (FRANÇOIS) 11-40. Veïci la St Jean (AUFFRET) 1-20. Voyage de l'âme des Celtes (Le) (BARONNET) 111-22. War an hent bras (LHOPITEAU) 1-54. This collection encompasses all generations. From those like the iconic Alan Stivell who brought the instrument back to life in 20th century Brittany, to the exciting harpists emerging today. And let us not forget those who have passed away in recent years, particularly Kristen Nogues whose music is being published here for the first time and the composer Pierre-Yves Moign whose work in the traditional Breton field and the Celtic harp in particular certainly has its place in this collection. 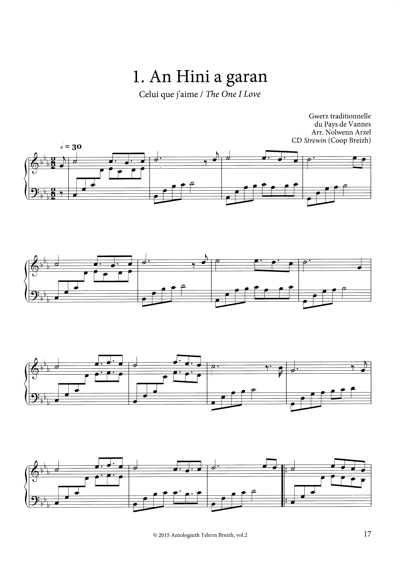 More than a hundred traditional tunes, arranged or composed mainly for the solo Celtic harp but also for duets or trios, have been brought together in this anthology. Known for its hundred faces and customs, Brittany is symbolized here by the diversity of styles and genres: historical tunes, gwerziou, dances, marches, slow airs, religious songs, sea shanties, songs, lullabies... all of which cover a wide range of what we call the pays of Brittany. The tunes have been classified into volumes according to the three levels of the Conservatoire: the first volume (elementary or level 1) contains simple tunes to introduce the basic technique of the instrument. Volume 2 (intermediate or level 2) consists of a wide range of difficulties and styles in order to develop this technique. And finally, volume 3 (advanced or level 3) goes even further, reaching a professional level. For the dance in particular, and unless specified otherwise, each tune in a set is usually performed several times before moving on to the next one. When indicated, variations allow the player to soak up the spirit of Breton music: an inventive style, never still, always turned toward creativity. Feel free to reproduce those variations or, better, invent your own. Some of the musicians wrote many explicit notes about the style, phrasings and dynamics; others left it up to the players. The fingerings have not been specified as they are often down to the teachers' and/or musicians' personal appreciation. We hope that you will have as much pleasure in playing these tunes as we had preparing this collection. ANTOLOGIEZH TELENN BREIZH would not have been possible without the harpists and those whose interest, enthusiasm and energy allowed the completion of the project. We are grateful to them for that. Special thanks to Alan Stivell for kindly granting us permission to publish a piece that he performed at the Maison de la Bretagne in Paris in 1953: Pedenn evit Breizh. This tune was arranged by his father, Georges Cochevelou who, in the same year, finished the making of his first harp, the "Telenn gentan". The publication of this piece is therefore a tribute to him who, through his dedicated work, was at the centre of the revival of the instrument more than sixty years ago. To all, we would like to express our deepest respect for the exceptional development of our instrument to which they have contributed.